Elena Kopin | Concierge Capital Management, LLC. Elena has been working in financial services for over past 30 years. 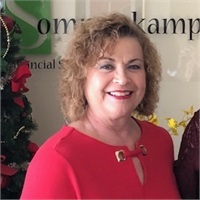 Initially, she got her start in banking but eventually made the transition to retail financial advice in 2006. Elena's main responsibilities of the office are creating a smooth onboarding process, organizing all the necessary paperwork and assisting with any emergency customer service issues that may arise. When she is not at the office, Elena spends her free time with her husband Michael and enjoys baking themed-cakes for special events.